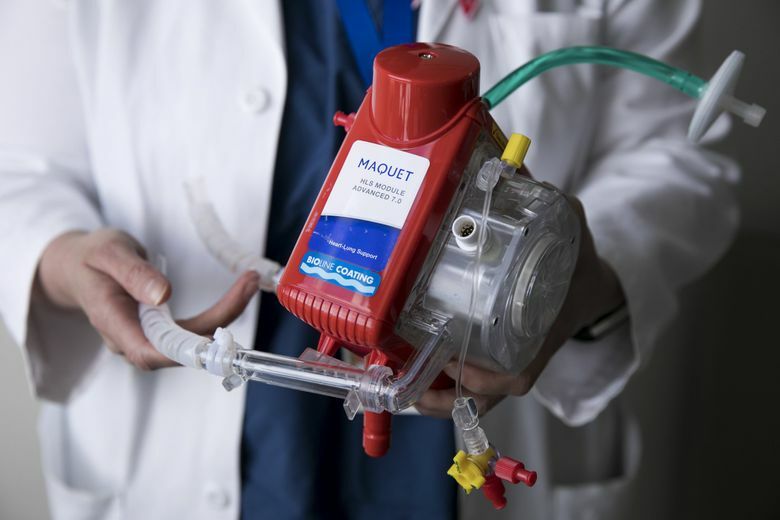 Heart-lung machines are doing a new job at Harborview Medical Center in Seattle, saving the lives of people with otherwise fatal injuries, like a woman who was pulled from Puget Sound and is thriving again. "I would definitely call it a miracle," says a Navy commander injured at Whidbey Island. Just before 3 a.m., the distress call came in to the Coast Guard’s Small Boat Rescue Station in Seattle: A young woman and another person were on a weather-battled paddleboat in the middle of Puget Sound — and they were sinking. The Coast Guard’s Travis Curley, 31, and three other crew members raced their 45-foot response boat toward the reported location of the distressed boaters. As they rounded Duwamish Head at West Seattle’s northern point, they heard from dispatchers that the woman had screamed just before the line went dead. “Most likely, that means she was now in the water,” said Curley, a boatswain’s mate first class, recounting the Jan. 21 rescue. After nearly two hours of searching through 4- to 5-foot waves and battling 35 mph wind gusts, a Coast Guard helicopter crew saw the 21-year-old Vashon Island woman floating face down near Seahurst Park in Burien. Curley and his crew pulled her from the water and performed CPR before she was loaded into an ambulance at the Fauntleroy Ferry Terminal in West Seattle. By the time she reached Harborview Medical Center, her body’s core was at 77 degrees and it had been at least four hours since her heart or lungs had worked on their own. Had it not been for the use of a machine that re-oxygenates and warms patients’ blood, “We don’t think she would have survived,” said Dr. Eileen Bulger, the UW Medicine physician who runs the hospital’s trauma unit. Against all odds, the woman made a full recovery; the man she was with did not make it. 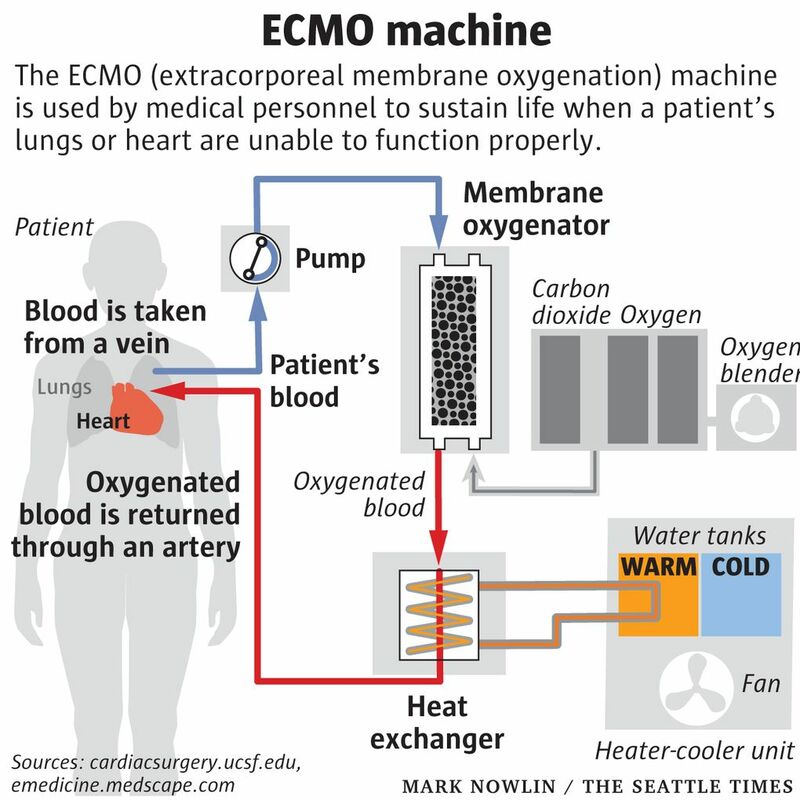 The Extracorporeal Membrane Oxygenation machine (ECMO) is a specialized pump that drains a patient’s blood from a major vein, adds oxygen, strips out carbon dioxide, warms it and pumps it back into the body. The machines have been used for decades as heart-lung machines during open-heart surgery and on newborns in intensive care. But in the last decade they have been used increasingly on adults with traumatic heart and lung injuries, in Europe and in some parts of the United States. Both Swedish Hospital and the UW Medical Center have ECMO machines that are used to support patients undergoing cardiac surgery. But those machines are reserved for specific patients under certain circumstances. In contrast, Bulger believes using Harborview’s five ECMO machines more widely to treat people with otherwise fatal lung and heart injuries fits the medical center’s mission as the state’s only Level I adult and pediatric trauma and burn center. “This technology is really encouraging,” said Dr. Steven Mitchell, UW Medicine’s medical director of emergency services at Harborview. Of the 28 patients who have been treated with one of the hospital’s ECMO machines, 60 percent have survived and most of the survivors have flourished. “I would definitely call it a miracle and I owe Dr. Bulger and her team my life,” said Cmdr. 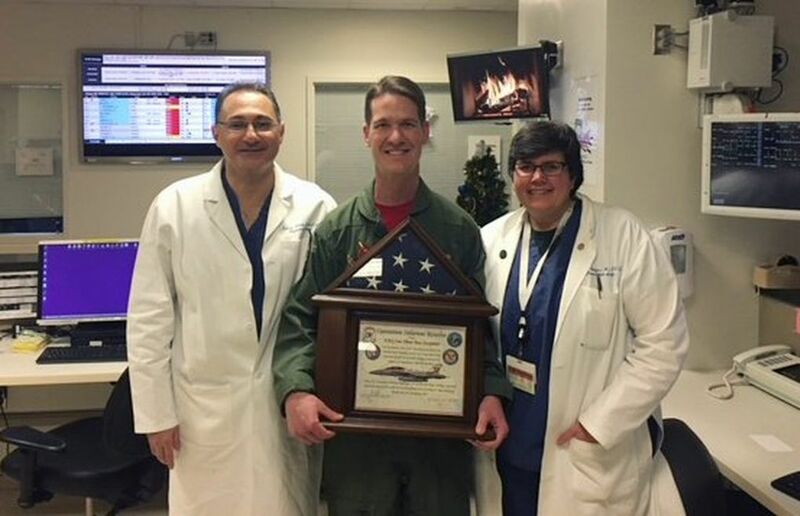 David Harris, a naval flight officer who suffered devastating lung damage in a December 2016 accident at Naval Air Station Whidbey Island. “There was massive overpressurization of a cockpit on the flight deck that essentially caused my lungs to explode and collapse,” he said in a recent telephone interview. His injuries were so severe that doctors believed he would not live, or if he did, his quality of life would be poor, he said. He was treated by Navy medics on the ground and on the flight to Harborview and put on an ECMO machine. The machine was able to do the work of his lungs during his recovery, and they fully healed. The 41-year-old married father of three young boys woke in the hospital on Jan. 3, 2017, and was discharged days later. He was back at work last Feb. 15 and was deployed with his squadron to the Western Pacific in March and later deployed to Turkey. When he returned, Harris — who is training for his first full Iron Man competition — visited the staff at Harborview. UW Medicine physicians Saman Arbabi, left, and Eileen Bulger, right, stand with Navy Cmdr. David Harris, who was saved with help from the extracorporeal membrane oxygenation machine, or ECMO, at Harborview Medical Center. The machine acts as an artificial lung to oxygenate blood when the body cannot. “It was really emotional for me to walk in there loud and proud and be able to say thank you to all the doctors and nurses and everyone that took care of me,” Harris said. The machine is not the answer for every devastating illness, disease or accident. It can’t restore neurological function lost to traumatic brain injuries, Bulger said. But for people like Harris and the woman saved last month from Puget Sound, it has, indeed, been a lifesaver. The Vashon Island woman, who asked not to be identified, has recovered with no apparent neurological damage. She was placed on the ECMO machine almost immediately after her arrival at Harborview, according to her doctors, and within about 15 minutes, her body temperature was up to normal and her heart had been restarted. Two days later, she was off the machine and giving her doctors the thumbs-up, Mitchell said. Mitchell said the woman reported to her medical team that she had no memory of the incident that claimed the life of Tyler Ingraham, 27, of Des Moines. Mitchell said that kind of amnesia is normal for a person who has suffered an acute traumatic event. But otherwise, he said, she was her old self again. “Her family definitely felt they got their daughter back,” Bulger said. When Travis Curley and his crew learned that the woman they had pulled from the water had survived, they went to see her. “Everyone on the boat … I don’t know how to say it … we felt bad. We thought we’d pulled a dead person out of the water, but when we got the update that she was alive and was going to make a full recovery, we were amazed. That’s not usually how the story goes,” he said. Bulger credits the Coast Guard crew as well as the EMTs who kept performing CPR long after some might have stopped. It absolutely set the stage for success, she said, and it’s one of the lessons she hopes people will learn from this: Learn CPR, don’t give up during a cold-water recovery and remember that Harborview’s ECMO machines are available.